Here’s a review long time in the making. 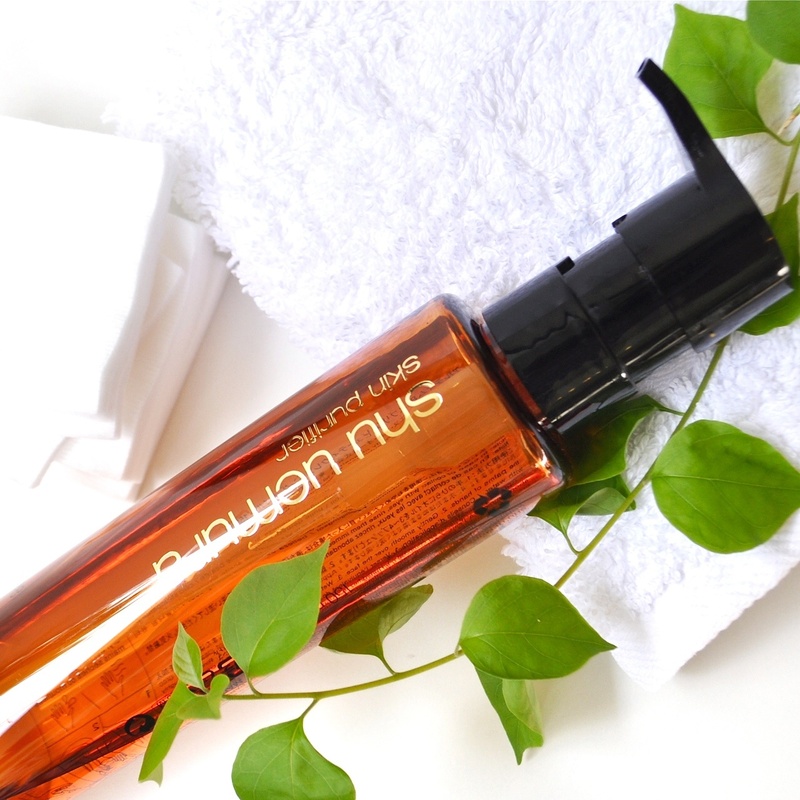 The lowdown on the Shu Uemura Ultime8 cleansing oil. As much as I love to put on makeup, I am someone who believes one should take the time to properly cleanse and take it off with just as much enthusiasm. For the longest time I used a regular foaming cleanser to take off my makeup and just follow with a toner. I now shudder at the thought! For those who still do this, please keep reading, you are about to find out why. The basic difference of a cleansing oil and a regular cleanser is, a cleansing oil is more or less designed to take off makeup and cleanse your face two steps in one. Whereas a cleanser is usually something that’s meant to just effectively execute the cleansing step, ie take off any dirt and grime off your face and not actually heavy makeup. Me being the obsessor, I like to use a cleansing oil after I have pre cleansed my face with a micellar water. This extra step assures me that there’s zero traces of makeup on my face once I cleanse and am now ready for some skincare! 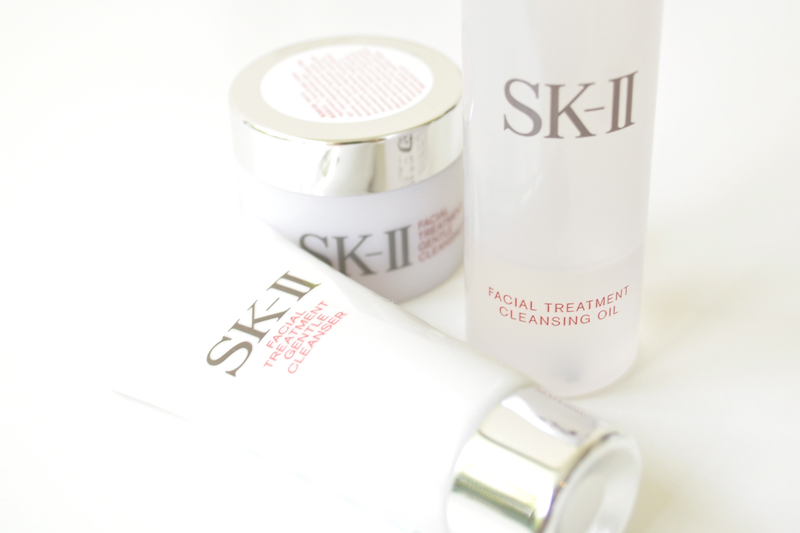 My very first encounter with cleansing oil was when I tried the SK2 oil about two years ago. And since, I have repurchased that and have also been using two of the Shu Uemura oils in rotation. Today I shall discuss the Ultime8. My favourite cleanser from the Shu Uemura range. It’s priced slightly higher than the others and is the ‘super’ cleanser from the bunch. If you are one who gets seduced by skincare claims by cleansers, this one is the ideal candidate for you to try as it’s the anti aging version. According to Shu Uemura it’s said to..
I’m sure you are interested in finding out if this statement is in fact true. So read on! Let’s start with packaging & product details. 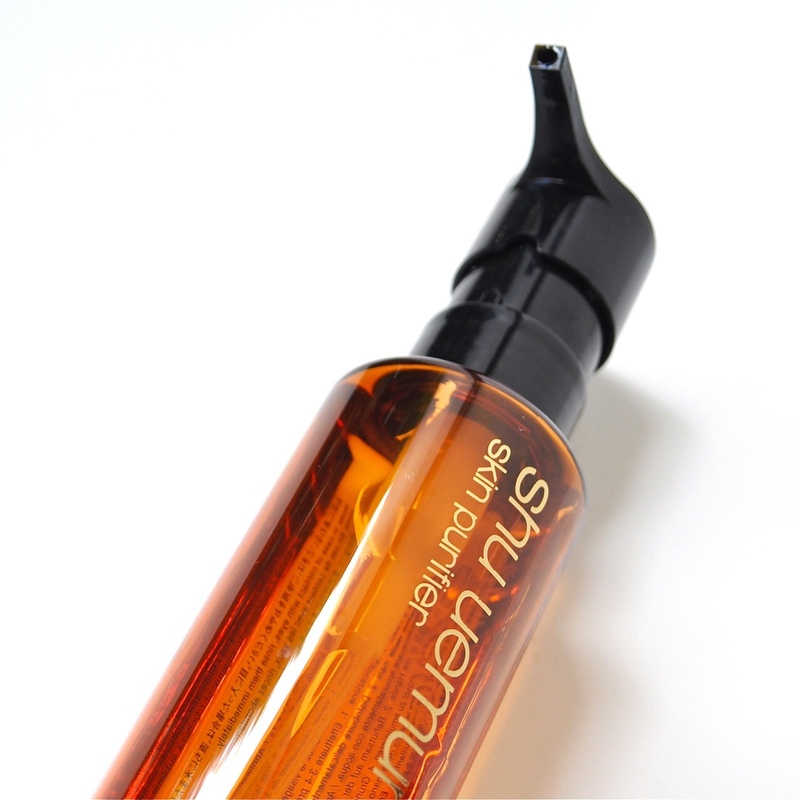 The Ultime8 is packaged in this amber coloured pump bottle which is ideal as it allows you to easily dispense the product without fumbling around with a cap and is also a very hygienic method of storing product. The product itself is slightly thicker in consistency compared to the other Shu cleansers i’ve tried. It feels more luxurious and for lack of a better word, smells ‘expensive’. I say this because usually I associate floral or sweet smelling skincare with poorer and cheaper quality! >.< Although this is purely my personal opinion! 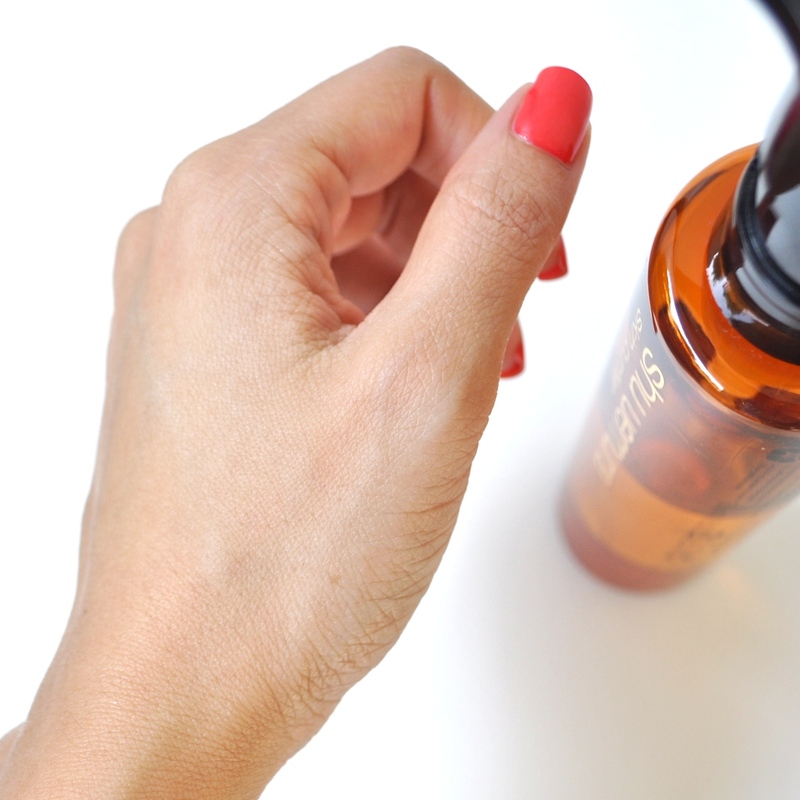 Many of you new to cleansing oils may not know this, but cleansing oil is applied directly onto dry skin. Unlike your normal cleanser where you would dampen skin with water in advance. 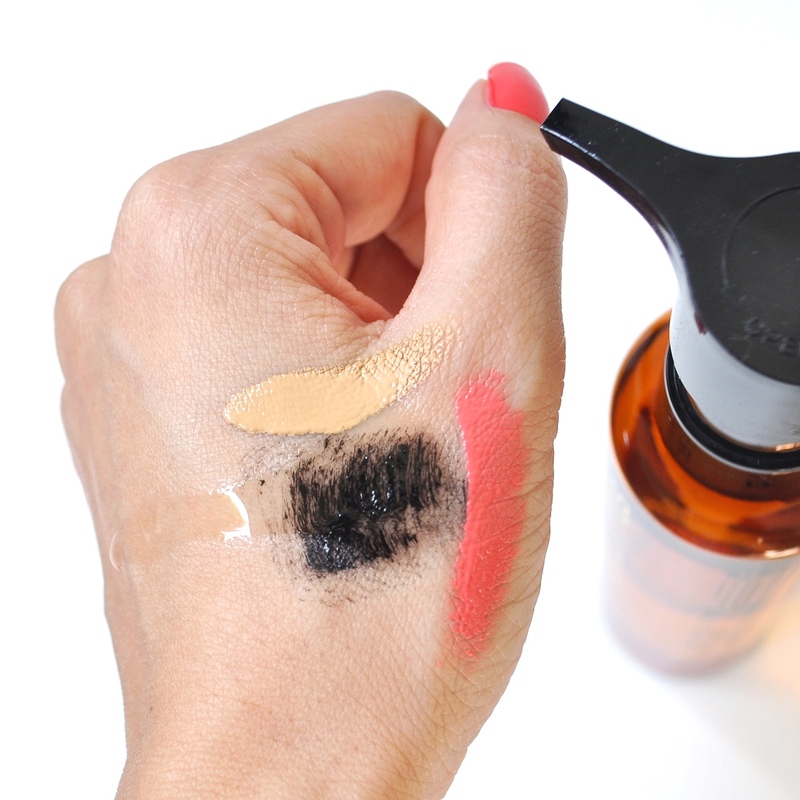 The reason being, the oil needs to come into contact with the makeup in order to break it down and as you know water and oil don’t mix, and dampening your face creates a barrier that oil would only sit on top of and not come into contact with your makeup. 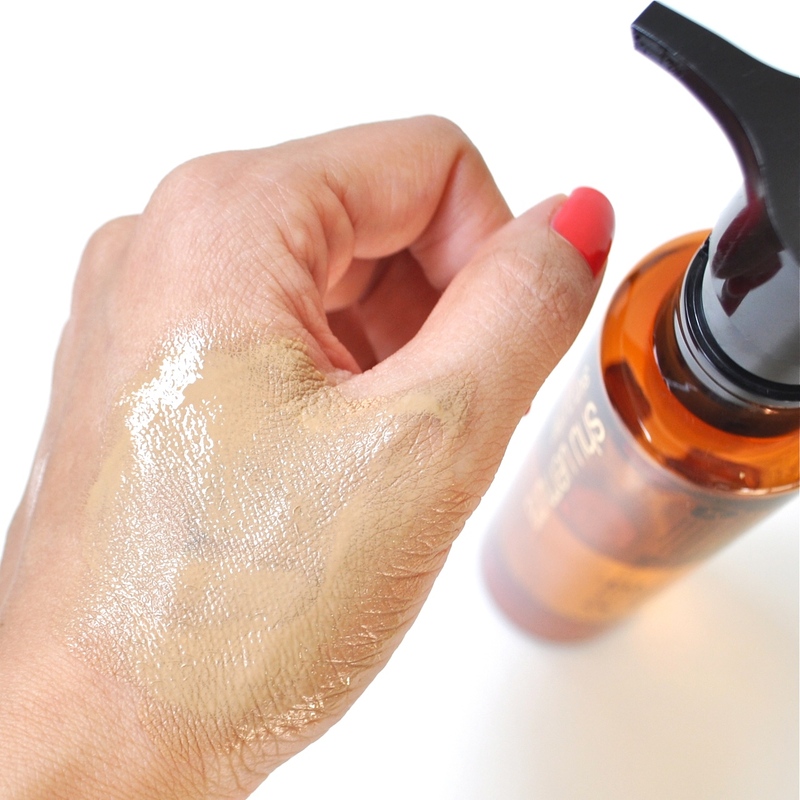 Slowly work in the oil onto your face with circular motions. And the makeup would start to dissolve. Emulsify by adding a little bit of water and continue with circular motions. You’ll be left with a milky solution now. 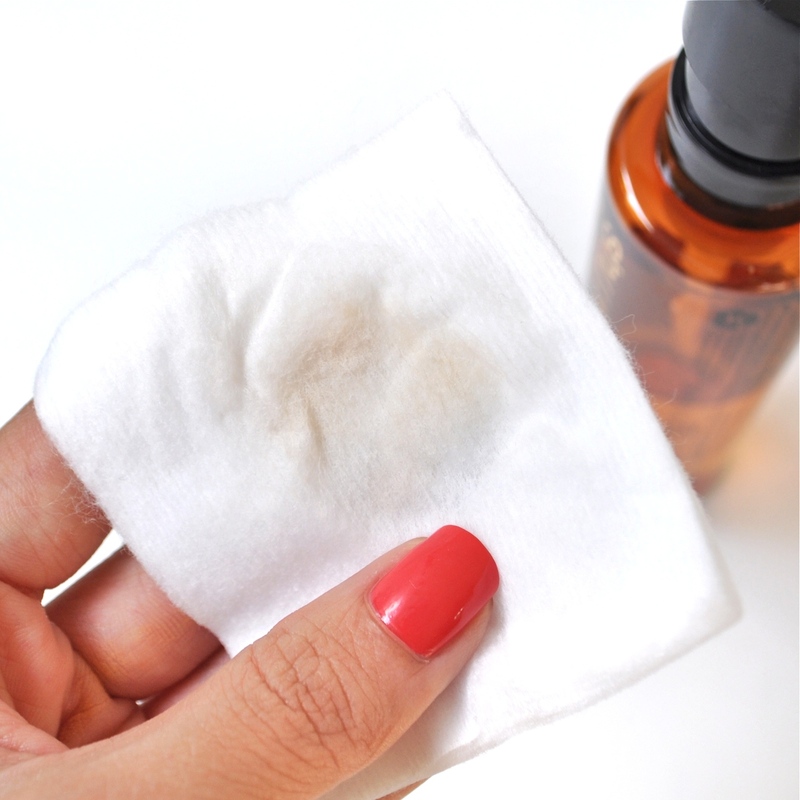 Now you are ready to wash this off, and finally take a cotton pad saturated with toner to wipe your face. I did this step to check if all makeup is off. And as you can see there is still a tiny bit of residue. If so, repeat the process. Or, if you are like me. Double cleanse. Use a Micellar water and take off any residue. The Ultime8 Cleansing oil is a gentle but effective way of taking off any makeup and thoroughly cleansing your skin. It leaves my skin soft, bouncy and mildly hydrated and never feels stripped and tight. I also love that it doesn’t leave an oily residue unlike some cleansing oils and I do feel that this would be perfect for everyone including those with oily to combination skin types but especially beneficial for those with dry or mature skin for it’s hydrating and conditioning qualities. P.S- I wouldn’t recommend this cleansing oil to anyone with sensitive eyes as it does feel uncomfortable if it makes it’s way there. Yes. You only need a very little to cleanse your face each night. And a bottle would last you well over 3 months depending on how many pumps you use. Available in a 150ml bottle as well as a larger 450ml bottle. After lengthy testing, I am finally reporting back on those SK2 cleansers I posted on Instagram last December! As you can see I have pretty much used up most of the product and am thoroughly acquainted with it before I share my findings. First off, let me give you a quick intro before we get on to business. Of course I haven’t reviewed the SK2 Mens Cleanser, but let me help you discover some of the others. So today I will share my thoughts on the Facial Treatment Gentle Cleanser, Facial Treatment Cleansing Oil and the Facial Treatment Gentle Cleansing Cream. The Facial treatment gentle cleanser is marketed as a face wash type cleansing cream that would normally be used after all makeup has been removed. *Photograph was taken with my hand prepped with a makeup base in order to show how the cleanser reacts on a face with makeup. At first glance this product is a nice creamy consistency and smells slightly of roses. It foams up thick and without many suds, more like milkshake frothiness if I needed to describe it. After it’s washed off, it leaves the skin feeling lightly hydrated and supple. No tight or tingly feeling. My skin felt clean and happy! Overall I’d say it was a very enjoyable experience. *Notes- At the time I was testing this out, I actually went right into taking off my makeup with this without any pre cleansing and I must say this still cleansed my face off makeup pretty effectively even though it’s recommended as solely cleanser and not necessarily a makeup remover. It is a no fuss product and if you are dipping your toe into the realm of SK2 skincare, you can’t really go wrong with this and best of all it’s mild enough for sensitive skin (I say this with conviction as mine’s sensitive, combination skin). 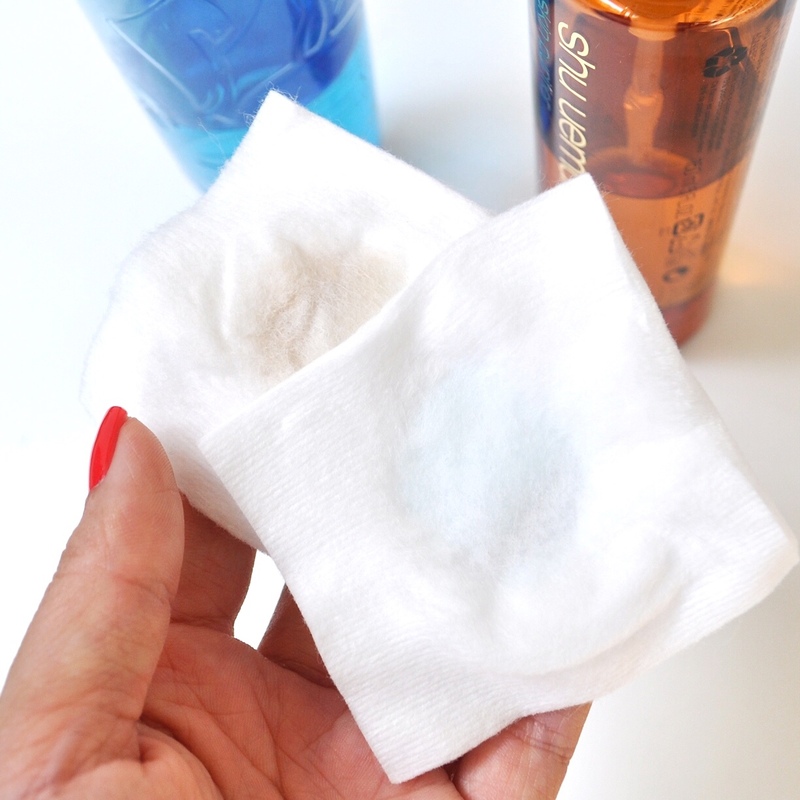 This was the very first oil based makeup remover that I tried, EVER. And now all cleansing oils have to meet this ridiculously high standard that this oil has set. It’s by far my favourite. I love the way the scent of roses washes over me when I apply this on to my face; it’s actually quite a pampering experience. I started off by applying the oil directly on to my face (without any water) and massaging it in circular motions to help break down the makeup. Then I go back in with a little water to emulsify and finally rinse it all off. I love how this took off every last bit of makeup. Even my mascara! (which is not waterproof btw) The convenience of not having to use a separate eye makeup remover was an enormous selling point for me, I love how convenient and quick taking off my makeup was. P.S- if you look closely at this pic you’ll notice, as soon as the oil comes into contact with makeup it starts breaking it down before I even get around to massaging it in! Effective! This too like the Facial Treatment Gentle Cleanser, left my skin feeling bouncy and supple. And I love it for that. As I know that not all oil from my face has been stripped off. I’d recommend it for all skin types as a gentle but effective cleanser. This is a cream type cleanser to take off makeup. It’s obviously more suited for those with dryer complexions and would be ideal for travel since there is no danger of this spilling. Now the full size product is actually quite a large jar, so if you are wondering how I recommend it as travel friendly, I am referring to decanting it first of course! So The texture of this is a thickish cream. It doesn’t seem to have that delightful light scent of rose that I loved in the other SK2 cleansers. I’m guessing it’s cos it’s overpowered by it’s typical ‘cream’ smell. Think Avene moisturisers, it’s a comforting scent nonetheless. I applied this directly onto my made up face and massaged it in circular motions to break down my foundation and other makeup, the texture thinned out when warmed by the heat of my skin and spread easily. 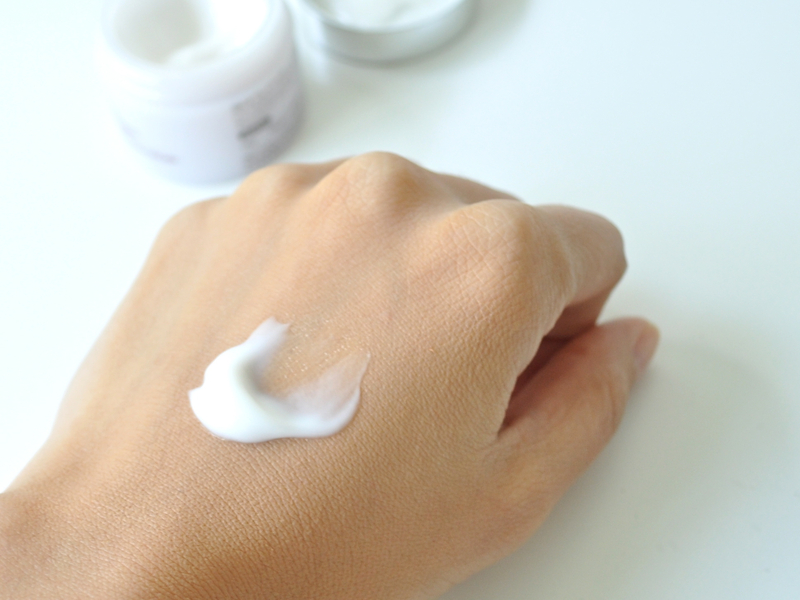 I must note that with this cream I found it a bit weird taking off my eye makeup, like applying curd all over my eyes >.< Not something I’m used to. But I guess if you are familiar with this type of cleanser, it shouldn’t be a big deal! After, I just took a tissue and wiped off the excess and washed my face. I did feel like there was still that creamy feel, I also noticed that my mascara had migrated to my under eye and never entirely came off. So I was compelled to go in with my Facial Treatment Gentle Cleanser to clear that feeling off my face! All in all, as a makeup remover, I found this ‘ok’. Not something I would consider buying in a full size. I believe if you plan on purchasing this, it’s best if you use a separate eye makeup remover than trying to use this on the eyes as well. In Summery, my favourites were the Facial Treatment Gentle Cleanser and the Facial Treatment Cleansing Oil. I actually went on to buy a full size of the Cleansing Oil cos I loved it so much. I adore the light smell of roses and it feels so pampering and luxurious. Although it’s a pricy product as far as cleansers or makeup removers go, if you are a current lover of the facial treatment essence, I know this would make a lovely addition to your skincare routine. The Cream Cleanser on the other hand I would only recommend to those with dry skin or mature skin as a mild solution to removing your makeup. It is definitely not my cup of tea though. All in all, I hope I left you enlightened. And feel free to ask any questions about my experience with these products. Just leave a comment below and I would get back to you as soon as I could. *I purchased mine online as a set of deluxe sized travel samples in order to try a lot of the products at once. This is also a great option if you have very sensitive skin and want to trial them out before buying.